Limnology Lab field trip to samples microcosms to investigate phytoplankton abundance in response to top-down zooplankton pressures and bottom-up nutrient additions. I was selected for an active learning summer short course and following year of meetings on active learning teaching techniques. The culmination of my participation in the fellowship was a presentation on how I compiled long term data collected during Limnology Lab to contextualize projects we conduct every year in lab within the context of up to 10 year trends in data. The students now include a graph of their class data compared to historic data with their final report. I took a one semester course on teaching and learning as used in biology with emphasis on inquiry-based teaching, active learning, and encouraging student participation. For the final project in the course I rewrote a lab for limnology lab to promote student inquiry and assessment of concepts taught in the lab. 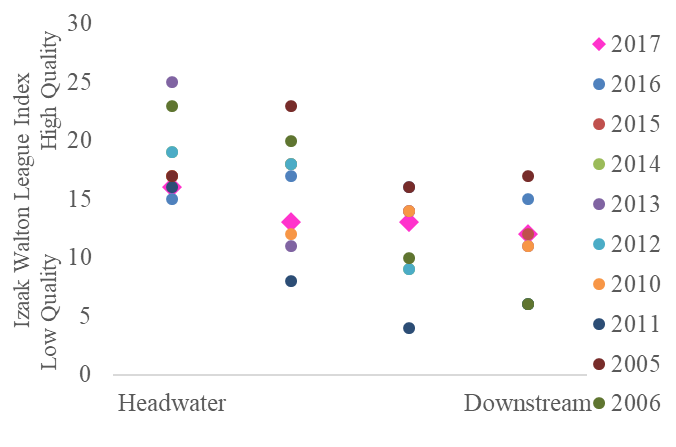 For more than 10 years, water quality generally declines from headwaters to downstream sites based on the Izaak Walton League index for assessing macroinvertebrates.